I’ve been talking about parsnips a lot lately. Mainly because my friend Valerie gave me one from her garden, and also because they are delicious when smashed with sweet potatoes and topped with goat cheese. 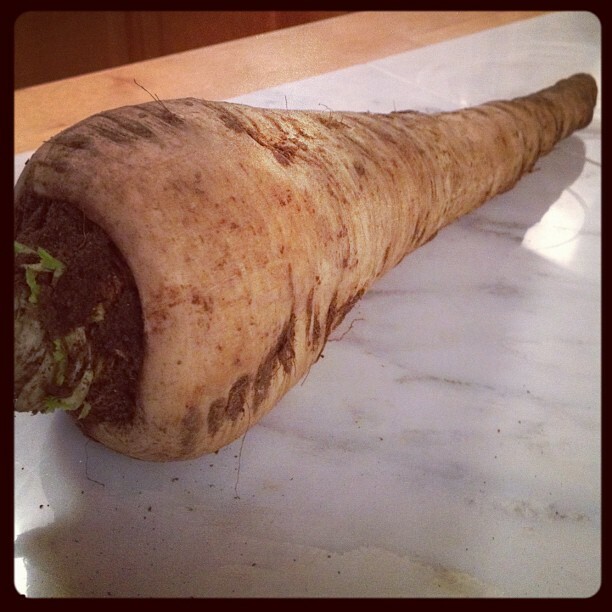 One particular parsnip, Valerie’s miracle parsnip, has brought me joy of another kind. Because of my review of said parsnip, Valerie’s husband Rogers included me as an example of “pretty good writing” on his blog, The Writing Rag. This blog shares tips on how to write well and satisfies the grammar nerd in me. I am honored and amused by this accolade. Honored because Rogers said my grammar was nearly perfect; except for a missing comma and one tense he would have changed. Amused because tenses are the bane of my existence (that’s dramatic, but you get the idea). There are times I change an entire post’s tense, only to change it back (I just changed the tense of this sentence, in fact). Passive verb tenses get me every time. That’s why I’ll be studying up on them via The Writing Rag. 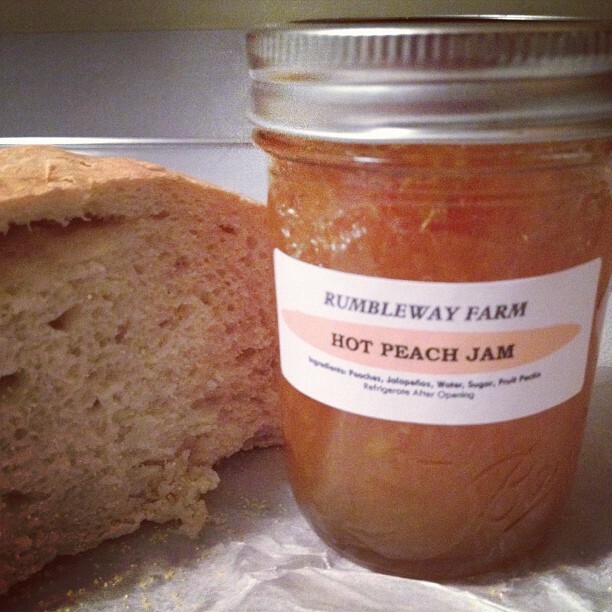 Another exciting accolade I received recently (I sound so “braggy”) was in the form of a fresh-baked loaf of bread and a jar of hot peach jam from Rumbleway Farm. Yes, you read that right. Hot. Peach. Jam. As in sweet peach jam with the warm, smooth heat of jalapeno. (And that, my friends, was a fragment. I do that sometimes. For effect. See? Sorry, Rogers!) My friend, Anita, gave me these gifts after hearing of my love for Rumbleway Farm. She attached a note that included the words, “P.S. I love your blog!” Yummy, yummy accolades. Thank you, Anita! The last accolade might not be an accolade at all, but it is exciting nonetheless. My friend, Beth, lives in Massachusetts (my former stomping ground). She’s a fan of my blog, and we’ve been conversing on Facebook regarding food, recipes, and gardening. As a result of reading my post, The Amish Know Best, Beth went to localharvest.org and found a CSA near her. Now, she and her three beautiful daughters will enjoy visiting Billingsgate Farm every Saturday to pick what goes into their CSA box. When Beth posted her plans for a summer CSA, I was thrilled beyond words. The fact that I had something to do with a family supporting a farm and, in turn, eating organic, affordable, and LOCAL produce is an accolade I will relish. It’s the whole point of Rachel’s Table! One more accolade in which I will bask: Mr. Writing Rag called my posts “useful.” Like I said, that’s the whole point of Rachel’s Table. I’m so pleased. Thank you, Parsnip. I love this ode to a parsnip! It’s probably my favorite vegetable so love it when someone else gets pointed out for using it well. I’m in love with parsnips too, Tammy. Such great flavor! CSA’s are so awesome! I am going to check it out now…..
Then you will have 2 great stories about that! Love Parsnips too, BTW! Yay! I just talked to two more friends that are buying a CSA. Im thrilled! Let me know how it goes. That local harvest website is great.